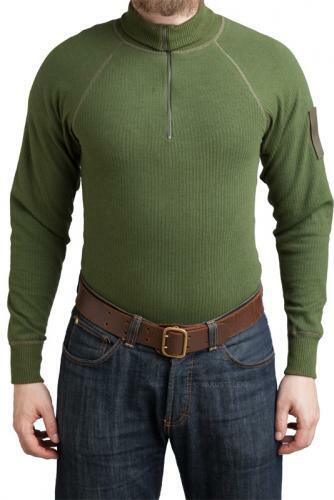 Among the best issue kit in the Finnish army is the turtleneck shirt, a direct copy of the Swedish M90 design. 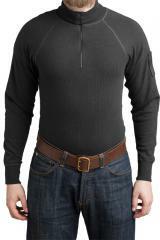 The moisture wicking blend of modacrylic, cotton and polyester makes this a functional base layer shirt for cold weather use. The discreet design doesn´t look bad paired up with civilian clothes either! Long hem, long sleeves and zippered collar, which can be worn open for ventilation or flipped up for protection, or flipped up and folded down as they do in the army. 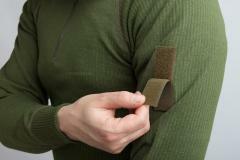 Velcro for Finnish military M05 rank patch on the left sleeve. Made of a mixture of modacrylic, polyester and cotton (17 / 50 / 33%). The modacrylic is is laid next to the skin, and transfers moisture outwards towards the top layer, which is polycotton. The fabric feels very comfy and is quite elastic. Wash in 60 degrees Celsius. 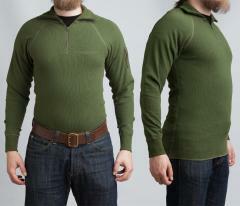 Compared to Merino woolen stuff these aren't as "fancy", but more robust and less pricey. Sizes in the classic "T-shirt style" with our estimate for the comparable EU size in the bracket, just pick what you usually wear. The sleeves are long, fit for most people. The fit is snug. Our model is 175 cm tall, EU size 48-50 (38-40" Regular) and wears S in the pictures. Loistava pukine. Varustelekan kannattaa teettää näitä lisää M05RES pukujen kaveriksi. Great product, lets just hope that more will be available or that Särmä will pick this up. Tää on vaan hyvä. Ei paljoa häviä merinovillaiselle. Aivan paras vaate kylmiin syysiltoihin! Mustana poolo on myös varsin tyylikäs. Toimiva tuote. Istuu hyvin, toisaalta joustaa sopivasti. Lämmin paita neljään vuodenaikaan. Kelien mukaan joko tämä päällimmäiseksi, tai takki kaveriksi. Käyttökelpoinen lukemattomissa olosuhteissa. Kokona M oli minulle sopiva (180cm/70kg) vaikka intissä käytin L kokoa.. Vaikka pitäisikin olla vastaava malli. Tiedä sitten? Pätevä paita. Hengittää, joustaa ja myös näyttää hyvältä. Siisti ja tyylikäs, musta käy työhön ja vapaalle!